Reporter Katie Jickling published a story titled "Cop on the Tweet: Chief's Social Media Posts Draw Criticism" in today's edition of Seven Days. I am quoted as one of the critics of the chief's social media posts. I also left one comment which has already garnered 26 "dislikes" in just under 10 hours. "...on June 22, when she used the social media platform to publicly accuse the Burlington police of brutality during an altercation..."
"...Within a day, Chief Brandon del Pozo took her to task. He used his personal Facebook account to comment on hers — specifically, he posted a detailed police press release refuting her version of events. He also sent the communication to the news media...."
Stop right here. As you can see from my unpopular comment, this is the part I object to. It is very intimidating for the chief of police to approach you online as a total stranger and start arguing with you. The police should avoid being needlessly intimidating. It does not matter what someone says, if they are just exercising free speech and not committing a crime, there is no business purpose for the chief of police to get involved directly with that person. He should assume if he goes to their Facebook page and starts arguing them, there is a chance the person might be intimidated into removing the message he disagrees with. And it's hard for me to believe he doesn't assume this, yet he does it anyway. "Very intimidating." She said I could quote her. Now why did Katie Jickling from Seven Days not ask the police chief "Do you think Ms. Huysman took down her post because she was intimidated by you leaving a comment on it?" That's the salient question here. And it would have been fascinating to read how he'd have have responded to it. "Huysman was charged with disorderly conduct, resisting arrest and simple assault on a law enforcement officer. The chief's post started a lively discussion on the teen's Facebook page. Many of the commenters were strangers to Huysman." It's hard for me to understand how this is considered appropriate. Would the chief want each one of his officers tracking down their suspects and leaving comments on their personal Facebook pages? Of course not. It would reek of police intimidation and be called cyber-stalking and cyber-bullying, not "twenty-first century policing." 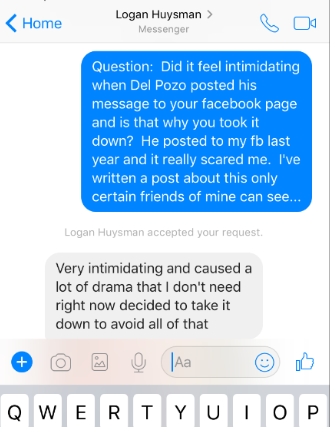 "When Huysman saw del Pozo's response and the outrage it generated, she deleted the entire thread. Del Pozo maintained that his post was necessary to quell the spread of false accusations. But it also triggered critiques from people who see his approach to social media as an abuse of power and a violation of individual privacy"
It is not the job of the police to "quell" free speech of any kind, whether it's about his department or not. This quote makes it sound like his goal was to get her to take the post down. 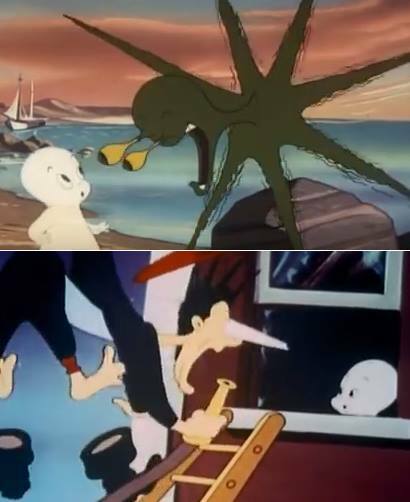 "Casper may be friendly, but he's been a ghost a long time. He knows very well he scares people." Later Jinkling moves on to cover my contribution to the story. I don't feel the quotes of mine she selected present the full depth of my arguments, and that's part of the reason I'm writing this post. She described my 'robot-soldier' tweet from last year, and the chief's direct messages to me on twitter in response. What isn't clear from the story is that I posted a screenshot of the tweet on Facebook, and screenshots of his direct messages that generated hundreds of comments, about the patch, police and social media and other topics... including some from the chief speaking in favor of his new patch. I told him respectfully I didn't think his participation was appropriate, and he responded that he took "great exception" to that. Of course I found that even more intimidating and uncomfortable. When he then sent me a friend request I just broke down and messaged him in a coarse way that he was a stranger to me and I considered every message and comment from him a form of intimidation. At that point he left me alone and to his credit I haven't heard from him since. But then again why should I? I'm not a criminal and I have the right to say whatever I want. I described each part of these interactions to Miro Weinberger in person last August, and I sent a letter to the chief explaining very clearly why I was uncomfortable with his messaging me directly. I cc'd Miro Weinberger and Selene Colburn on it and I gave a copy of this letter to Katie Jinkling from Seven Days too when she interviewed me for the story. The point is that the mayor and the chief were duly warned last year that this social media behavior is intimidating, or potentially so, and should be avoided. "Bedrosian deleted the post and blocked del Pozo. "I remain intimidated by Brandon del Pozo to this day," he said"
"To see this happen again is troubling"
"After the Huysman posts, Bedrosian voiced his concern at a city council meeting last week. 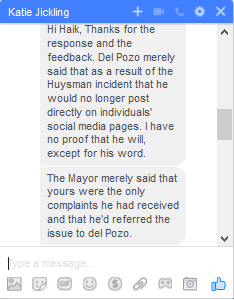 After the meeting, Council President Jane Knodell said it was the first complaint she'd heard about del Pozo's social media practices. Councilor Kurt Wright seconded that, but they both agreed that Bedrosian had a point. Knodell said she'd refer the matter to the police commission." I will post the full text of my comments to the city council at the bottom of this post, but you know what's interesting about this? After I spoke and exited City Hall, Kurt Wright came chasing after me along with Katie Jinkling and introduced me to her. What I heard him say was that he and other city councilors were already discussing the topic, and that Logan Huysman had a right to free speech and should not have been intimidated out of it by the chief. Based on this I do not believe that mine was the first such complaint heard by either Kurt Wright or Jane Knodell either for that matter. I think the entire city council has a general sense there's an issue and the mayor certainly does. Some of the concepts are subtle but he understands the ethics involved. I don't care how many "dislikes" my comments get. The mayor went to Yale and Harvard. Don't tell me he doesn't get it. "Del Pozo, too, said he's learned his lesson. He'll continue to express himself on his own social media accounts, but he's done posting on the individual Facebook pages of others. "It may well have sufficed to put it on my own page or our own Twitter feed," he conceded." It would be very good news if the chief does in fact stop posting to the individual Facebook pages of others, or the individual social media of any kind hosted by an individual citizen, but I would feel a lot better if the head of the police department was someone with the good judgement to never have done it in the first place. I was a little concerned it doesn't necessarily follow that merely conceding it would have sufficed to post to his own platforms means "he's done posting on the individual Facebook pages of others" so I asked Katie Jinkling what he said to justify writing that and here was her reply. As with Jane and Kurt, I don't think my complaint was the first the mayor heard of the issue either. I think it's likely he has heard of other complaints, and is parsing language to say mine was the first complaint that he heard (directly). And it's not clear what referring it back to the chief would accomplish. In any event... If mine was the first complaint, it appears to have been an extremely effective one, since the chief has promised to change his practice. That's not enough though. What should have been mere common sense will probably need to have some rules written around it now. I'm Haik Bedrosian. I'm a former Burlington city councilor and a former school commissioner. I live in Ward 7. My message to you is that it is inappropriate for the chief of police, or any police officer to leave comments in the social media of individual citizens. I am here to testify that it happened to me last year when the chief left comments on one of my Facebook posts and I found it very intimidating. I let him and the mayor know that I found it intimidating. I told Jay Diaz of the Vermont ACLU about it and he said ACLU had already received a number of complaints from others about the chief making them uncomfortable on their social media. On June 23 WCAX.com reported about BPD's arrest of a South Burlington teenager who had posted on her Facebook page pictures of bruises she said the police gave her. Quote: “Burlington's police chief is firing back with a strongly worded statement he posted to Huysman's Facebook page.” Huysman has now taken that post down and I am certain it was because the chief commented on her Facebook page and she found it intimidating. I know the mayor is certain of this as well. There is no legitimate business purpose for the chief of police to have gone to this person's personal Facebook page, and leave a comment there contradicting her. The police have a special responsibility to not unnecessarily intimidate people. By personally commenting on an individual's Facebook post the chief sends a message that he is personally watching you, and when he visits your page and argues against you, the asymmetrical power dynamic tends to result in the post itself being taken down. Freedom of speech is just a concept and it's a very fragile thing in real life. If he wants to put his side of the story out, then he has any number of his own social media platforms to do it on, and it's important that he stick to them because what he says and writes should be a matter of public record. Whatever his comments were on my post last year, and what he posted on Logan Huysman's page is no longer available to the public, at least as primary sources. First: the police should always remember that any tweet, comment, message or emoji they send from a police email or social media platform carries the full authority and power of their position and that they represent not just their own point of view, but that of the police department and the city of Burlington. Any officer , including and especially the chief carries his badge and his gun into any online social media debate he gets into, and as such it should be *assumed* approaching a stranger online for any reason can be intimidating to that person. Second: to the extent possible the police should avoid getting into online debates with people about anything. The police exist to protect people's freedom of speech, not argue with them about it from their own personal point of view or even from the point of view of the department. Third: based on the premise that an officer of the department, speaks for that department and the city when engaging in social media, the preservation of what that officer says and posts for the record becomes a matter of public interest. It is therefore advisable that to the extent possible the police limit their online engagement to the media platforms they control and can preserve for the record, such as their own Twitter, Facebook and web pages... Or perhaps to those connected to a commercial media entity with a physical address like the free press or Seven Days... But avoid engaging on citizens personal Facebook, Twitter etc, because that person will be free to change or delete what was said. That person may also not welcome it and find it extremely impolite and intimidating. Balanced, logical and provoking. To come into your house and have such an interaction would either require your permission or that of a Judge upon finding of probable cause? No doubt the chief and any officer impacted has the ability to express themselves via official channels within the context of their supervisory structure. Supporting the Troops is well accepted. Finger wagging is usually not a part of the official response from city departments. Being told to mow your lawn is based upon the authority of the city code, and I know of no section of said code that grants authority to city employees to ..... well, I guess that is discussed adequately above..